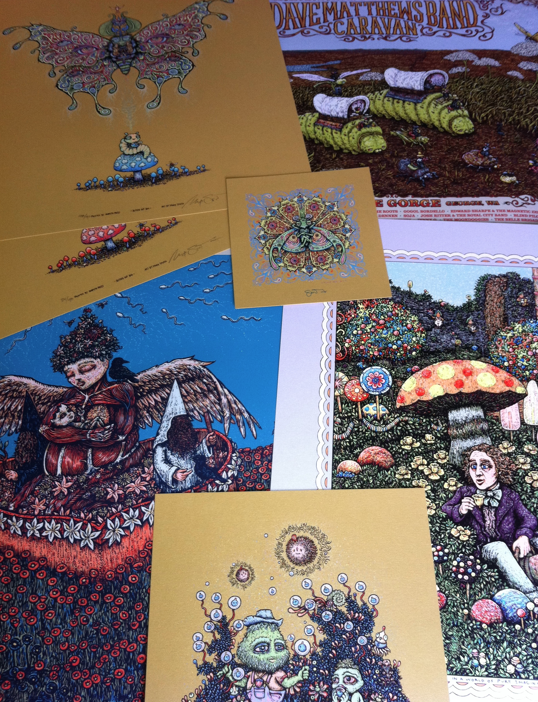 Many new prints and posters will be sporadically released in the Shop in the following weeks. “Out of Stock” items may become available once again and new items will be added. We plan to move into a pattern of consistent weekly sales versus the announced batch releases that led to software and hardware problems in the past. So when the urge arises, stop by the Shop to see what new items have been added. Since the inventory may change from day-to-day, orders made at different times can be combined for shipping. The DMB Caravan Gorge Posters are being sold through a customer lottery. Looking great! Can’t wait to see some of these in person! Keep em coming, we’ll buy em! any ‘out of stock” Dogfish Head Brew prints ? Just unpacked my “World of Pure Imagination” print and I have to say it’s beauty far surpasses even my wildest imaginations! Outstanding work good Sir. Nice work! Would love a chance to get that baby bliss bug with the Moth over it! Would look sick next to my Panic Halloween Print!